Bloggers are advised to show a list of their most popular posts to readers and I decided to do so lately. At the bottom right of all the pages here in my blog, I installed the WordPress Popular Posts widget that parses the data on my WordPress.com Stats plugin. Due to lack of space, only the top three (3) most visited among my posts that currently totaled 460 are shown. As a blog under Mixed Bag category, you would noticed that the topics of my Top 3 articles vary and somewhat not related with each other. 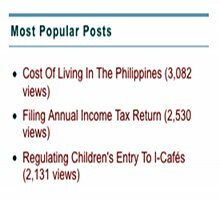 My top article which continue to get the most visits nowadays is about the cost of living in the Philippines where I compared how life was when I was young in the 1960’s, in my growing years in the 70’s and the 80’s till now when it seems to be too high for the majority of our people. Honestly, I am wondering who are searching the web on my most popular topic. Are they students ordered by their teachers to make a study on the subject or foreigners considering to retire in the country? I can understand why my article on filing annual income tax return is scoring and continue to get high page views. Most single-owned businesses, i-cafés included, cannot afford the services of competent bookkeepers so in their efforts to look for ways to comply with taxation rules, they search for it in the Internet and usually reach my blog post on the matter. I wish I could help them further by posting more about the topic but I regret that I cannot do such because taxation is not within my realm of competence. I tend to believe that my third most popular blog post published in my early stages of blogging, hits my target audience then and now, the i-café owners, . That was when I use to write about the i-café business in my aim to discuss about the ins and outs of the industry. The entry of students of minor age to i-cafés has always been an issue in all areas where the business exists and my article discussed the various ways by which local government units regulate such action. Blogging gurus also say that follow-up articles about the popular posts of a blogger must be done. That way, a blogger can expect more page views especially if an update note is incorporated in the old popular posts. As someone who have committed to go on with blogging, you can expect me to also follow this advice when developments warrant updates on my popular topics. NOTE – I wrote the above article four days ago when the referred plugins were still functioning on WordPress Version 2.9.1 that hosts this blog. I am now experimenting on which Popular posts plugin to replace them so different articles are now showing on the widgets I installed lately.